While airlines are continuously increasing their revenues, it's interesting to note that they’re not doing it the same way. 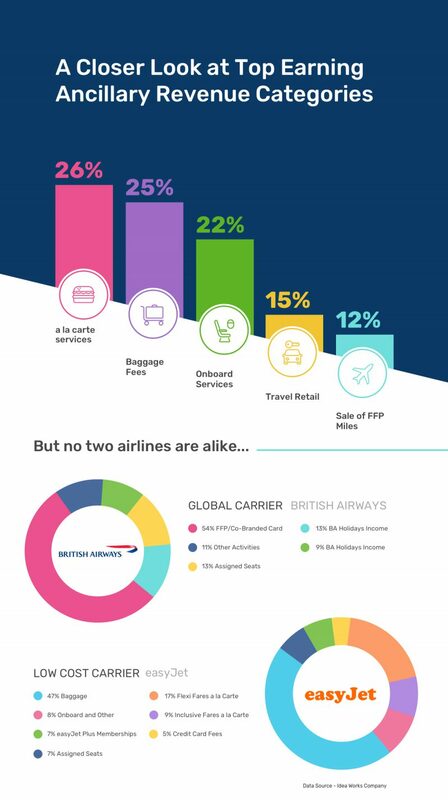 While a-la-cart or baggage services technically bring in the most ancillary revenue, airline type (global vs. low cost) has a large effect on how the brand makes its earnings. For global brands, frequent flier programs and co-branded credit cards make up for the majority of the money coming in. Brands like British Airways make 54% of their revenues through these tactics. Conversely, discount airlines rely on extras like baggage fees to boost their numbers. For low-cost airline, Hong Kong Express, baggage fees accounted for a whopping 64% of their ancillary revenues for 2016. For both global and discount brands, a tiered fare model can bring in a good portion of extra money. The tiered fares (a “good, better, best” approach) only count as ancillary revenue for the ticket sales that come in at the premium price. The basic option is not categorized under the ancillary umbrella. Other features and services bringing in ancillary revenue include assigned seats, comfort seating upgrades, credit card fees, trip insurance, and onboard sales.